The City of Italy Park Board will have their regular monthly meeting Monday, March 26, 2012. The meeting will be held in the Council Chambers of the Italy Municipal Building at 105 West Main Street, Italy. Meeting time is set for 6:00pm. 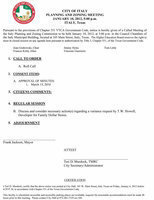 The agenda slates there will be a discussion regarding the bylaws of the Park Board, Park Board meeting scheduling as well as discussion and planning for the upcoming Mayor’s Easter Egg Hunt. Proven conservative Paul D. Perry has announced that he will seek the Republican nomination for Ellis County Commissioner, Precinct 3. At today’s regularly-scheduled meeting, the Ellis County Commissioners’ Court approved seven different contracts for various types of road-building materials. The bidding process took place in January and February, with more than 30 vendors requesting the bid package. Eleven vendors submitted bids, along with material samples, which were tested by the County Engineer’s Office. Results of the testing were reviewed by the Commissioners. 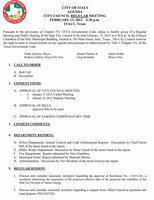 The Italy City Council will have their regular monthly meeting today, Monday, March 12, 2012 in the Council Chambers of the Italy Municipal Building (105 West Main Street, Italy). Meeting time is 6:30. The agenda slates six Regular Session agenda items and one Closed Session agenda item. The meeting is open to the public. The Avalon Water and Sewer Service Corporation (AWSSC) met Thursday evening for their regular monthly meeting. Topics for discussion were on the purchase of Gillespie land, hiring another meter reader, hiring an attorney, health insurance for Gregg Rodriguez, sewer update and appointing John Goodwyn’s replacement for vice president on the board. Susan Welch-Rodriguez has announced her candidacy for the office of Ellis County Sheriff on the Republican ticket. Mrs. Rodriguez has more than three decades of experience with the Dallas County Sheriff’s office and retired in 2009 collecting more than 100 commendations. She still serves with the Sheriff’s Posse and is the only Ellis County Sheriff candidate that is endorsed by the Dallas County Sheriff Association. With a Federal Communications Commission deadline of January 1, 2013 for narrow-banding of radio communications, Ellis County Commissioners awarded the bid for “Design and Modification for Repairs of VHF Radio System” to BearCom Wireless Worldwide. The action was taken during the Court’s regularly-scheduled meeting on Monday, February 27, 2012. 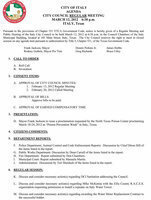 Notice is hereby given that a Public Hearing will be held by the Planning and Zoning Commission on Monday, March 12, 2012 at 6:00 p.m. and a second Hearing by the Italy City Council on Monday, March 12, 2012 at 6:30 p.m. in the Council Chambers of the Italy Municipal Building, located at 105 W. Main Street, Italy, Texas, to consider a request from Albert Garcia for a Specific Use Permit for the sale of used furniture and other house hold items in the yard at 317 E. Travis approximately 0.139 acres on E. Travis, Italy, Texas, according to the plat recorded in volume 01039, Pages 1075. deed of records, Ellis County, Texas. The Italy Police Department is extending the deadline for accepting applications for the 1st Citizen Police Academy Class to March 1, 2012. The first class will begin March 12, 2012 (instead of March 5, 2012 as stated earlier) from 6:00 p.m. til 9:00 p.m. and will continue every Monday for 8 weeks. Students will also get to ride along with an officer for a partial shift. The City of Italy and the Italy Economic Development Corporation closed Friday on the purchase of the former Wayne Boze Memorial Chapel located at 161 W. Main, according to Teri Murdock, city secretary/administrator. The facility, renamed the Boze Community Center, will soon be in service as a community center for local residents. Residents planning on running for the Italy City Council or Italy School Board of Trustees must turn in a completed packet before 5 p.m. on Monday, March 5, to either city hall or the school administration building, respectively. Elections will be held May 12 from 7 a.m. until 7 p.m.
Ellis County officials gathered Friday evening to recognize employees for their years of service to the public. Residents interested in running for the Italy City Council must turn in a completed packet to city hall before 5 p.m. on Monday, March 5. The Italy City Council will have their monthly meeting on Monday, February 13th, 2012. The meeting will be held at the Council Chambers, 105 Main Street, Italy. Meeting time is 6:30pm. The agenda slates four Regular Session items and one Closed Session item. The City of Italy Park Board will have their regular monthly meeting Tuesday, February 7, 2012. The meeting will be held in the Council Chambers of the Italy Municipal Building at 105 West Main Street, Italy. Meeting time is set for 5:30pm. Discussion regarding the recent Christmas Festival as well as the upcoming Mayor’s Easter Egg Hunt is slated on the agenda. Four of Ellis County’s bridges are slated for replacement, with funding coming through the federal off-system bridge program administered by the Texas Department of Transportation. During the regular meeting of the Commissioners’ Court on January 9, Commissioners took no action on a proposal to set a public hearing on raising the weight limits on Arrowhead Road, which is adjacent to the former Superconducting Super Collider. The Avalon Water and Sewer Service Corporation (AWSSC) met Thursday evening for their regular scheduled meeting. Topics for discussion were on purchasing the Gillespie land and discussion on the KSA Engineering contract. On Monday, January 9, 2012, the Ellis County Commissioners Court appointed Joseph Stewart as the new Fire Marshal. Stewart will also act as the Emergency Management Coordinator for the County. A discussion-only agenda item regarding a possible increase in weight limits on Arrowhead Road, adjacent to the property commonly referred to as the Superconducting Super Collider, brought a large and concerned, but respectful, crowd to Monday’s regularly scheduled meeting of the Ellis County Commissioners’ Court. Three council seats are up for election, according to Teri Murdock, city secretary/administrator, at the Italy City Council’s monthly meeting held Monday evening. Those seats are currently held by James Hobbs, Dennis Perkins Jr. and Bruce Utley. 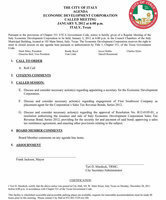 The City of Italy Planning and Zoning Board will have a called meeting Tuesday, January 10, 2012. The meeting will be held in the Council Chambers of the Italy Municipal Building at 105 West Main Street, Italy. Meeting time is 5:00pm. 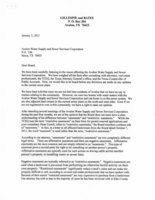 The agenda slates there will be discussion of a variance request by T.W. Howell, Developer for Family Dollar Stores. Special Meeting called by Avalon Water and Sewer Service Corp. 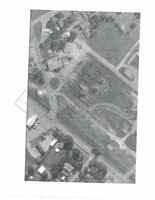 The Avalon Water and Sewer Service Corporation (AWSSC) met Thursday evening for a special meeting to decide on contracting with KSA Engineers, contracting with Dean Carrell and to hear a statement by Carol Gillespie (land owner) concerning the the sewer plant. The Italy City Council will have their monthly meeting on Monday, January 9th, 2012. The meeting will be held at the Council Chambers, 105 Main Street, Italy. Meeting time is 6:30pm. The agenda slates three Regular Session items. The Italy Economic Development Corporation and the Italy City Council approved the financing for a community center – the Boze Building located at 161 W. Main — at called meetings Thursday evening. The Italy EDC will have their monthly meeting on Thursday, January 5 at 6:00pm in the Council Chambers of the Italy Municipal Building at 105 Main Street, Italy. The agenda for this called meeting contains three action items. There will be a called meeting of the Italy City Council on Thursday, January 5, 2012 at 6:30pm. 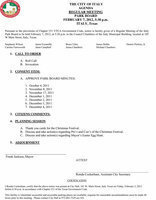 The council will discuss and consider necessary action(s) regarding Resolution R11-0105-01A, a Resolution approving a program of the Italy Economic Development Corporation, Inc.; approving a resolution of the Corporation authorizing the issuance and sale of sales tax revenue bonds by the Corporation; approving a sales tax remittance agreement; and enacting other provisions relating to the subject. The City of Italy Park Board will have their regular monthly meeting Tuesday, January 3, 2012. The meeting will be held in the Council Chambers of the Italy Municipal Building at 105 West Main Street, Italy. Meeting time is set for 5:30pm. Discussion regarding the recent Christmas Festival is slated on the agenda. Now you will know her as a certified police officer. 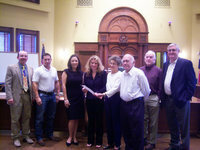 Following through with the Court’s directive to actively pursue cost savings on all fronts, Ellis County Purchasing Agent Alisha Wickens asked Commissioners for approval to participate in two cooperative purchasing programs, the National Joint Purchasing Association and the Cooperative Purchasing Network. Police Chief Diron Hill welcomed friends and family of our local police department to the 2011 Italy PD awards banquet on Saturday night. 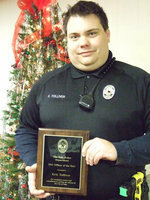 Several commendations were given and Officer Eric Tolliver was awarded Officer of the Year. Sue Lauhoff was honored as Civilian Employee of the Year. Jay Fox, CEO of Baylor Medical Center of Waxahachie, and David Anderson, CEO of Ennis Regional Medical Center, encouraged Ellis County to enter into an Affiliation Agreement under a State program that allows local governments and private hospitals to work together. For every dollar that the County contributes toward indigent health care, the hospitals will potentially be able to receive matching Federal Funds of $1.39. The Italy City Council voted to approve the exchange of property with Family Dollar at its monthly meeting held Monday evening in council chambers. The Avalon Water and Sewer Service Corporation will have their regular monthly meeting Thursday, December 8, 2011. The meeting will be held at the First Baptist Church in Avalon. Meeting time is 7:00pm. 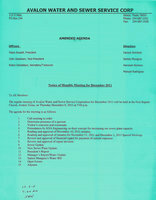 The meeting agenda is included with this notice. The City of Italy Park Board will have their regular monthly meeting Tuesday, December 6, 2011. The meeting will be held in the Council Chambers of the Italy Municipal Building at 105 West Main Street, Italy. Meeting time is 5:30pm. The agenda slates there will be discussion of pros and cons regarding the recent Christmas Festival. With a Federal Communications Commission deadline of January 1, 2013 looming ever closer, Ellis County Commissioners approved a contract extension with RCC Consultants that will take the County to full compliance. The action was taken during the Court’s regularly-scheduled meeting on Monday, November 28. The Avalon Water and Sewer Service Corporation met in a special meeting Thursday night to discuss their current engineering contract and to approve money to make necessary repairs to get the sewer system functioning properly. The Italy Police Department is on Facebook! The Italy Police department has joined thousands of other agencies across the nation by creating its own Facebook page to disseminate information to citizens regarding issues, crime alerts, safety tips and law updates. 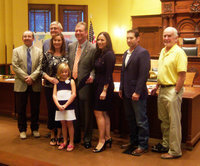 The Janicek Family Farm and the Walker Creek Ranch, located near Ennis, were recognized in Commissioners’ Court during the regularly scheduled meeting on Monday, November 14, 2011. The Reverend Ronnie Dabney was honored Monday evening at the monthly meeting of the Italy City Council. The Italy City Council will have their monthly meeting on Monday, November 14, 2011. 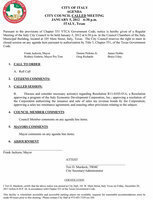 The meeting will be held at the Council Chambers, 105 Main Street, Italy. Meeting time is 6:30pm. The agenda slates six Regular Session items which includes several new resolutions as well as all of the other department reports. In an effort to save tax dollars, Ellis County Commissioners voted today to extend the County’s contract with Suez for electricity. The extension will begin in December, 2013 and will run for 18 months at a price of 5.587 cents per kilowatt hour. The Avalon Water and Sewer Service Corporation met to discuss TCEQ violations and possible fines they are facing during its monthly meeting Thursday. 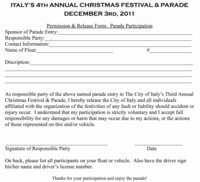 The Italy Park Board is searching for local veterans to serve as grand marshals for the Italy Christmas Parade and Festival scheduled Saturday, Dec. 3, in downtown Italy. After hearing a presentation on the topic from Larry Eon of Texzon, Commissioners met today in a special meeting to take action authorizing the County Judge to execute all necessary documents to lock in electricity rates for 18 months. Expected savings over the 18 month period, which begins in December, 2013, will be over $100,000. The City of Italy Park Board will have their monthly meeting today, Tuesday, November 8, 2011. 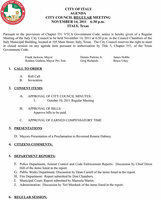 The meeting will be held in the Council Chambers of the Italy Municipal Building at 105 West Main Street, Italy. Meeting time is 5:30pm. 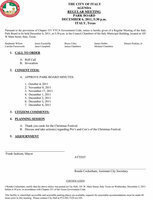 The agenda slates the Christmas Festival as the lone planning session item. 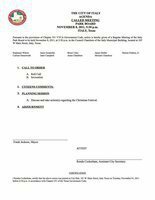 In a special meeting called for Friday, November 4, 2011, Ellis County Commissioners voted unanimously to lift the ban on outdoor burning, at least temporarily. In the regularly scheduled meeting of the Ellis County Commissioners’ Court on Monday, Dr. Harold Nolte, Jr. was recognized for his years of outstanding service to the community.